To Drill a Water Well, Powered Equipment is Required. This Increases the Speed and Depth That Can Be Reached. 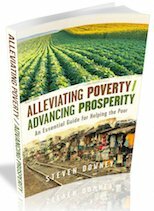 Note: The content on this page has been adapted from publications of Lifewater International, written by Fred Proby. The objective in choosing a method to drill a water well is to use the least expensive method that can be successful given the type of material that must be drilled through and the depth that must be drilled to reach an acceptable source of groundwater. Often, there are no options, and the choices we have are limited, maybe even non-existent. But the method used to drill a water well must match the geology. 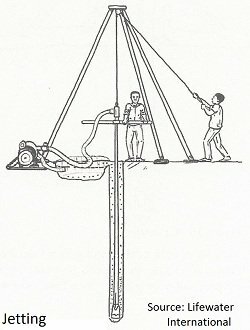 Most manual well drilling methods have been adapted to use machine power instead of human power. Also, powered methods have been developed that can drill larger diameter boreholes much deeper and faster than any manual method. Machines used to drill a water well are typically called a "drill rig" or just a "rig". This method employs a pump to force a flow of water down a drill pipe and out a narrow nozzle to make a ''jet'' of water that loosens the sediment. The return flow of water outside the drill pipe carries cuttings up to the surface and into a settling pit. The pump then returns the water back down the pipe. The drill pipe is suspended from a tripod and rotated by hand to keep the borehole straight. This method only requires lengths of pipe and a water pump that can generate sufficient pressure. The pipe is often left in the ground to serve as the well casing. In fine sand, a 5 cm diameter PVC pipe can be rapidly advanced to more than 60 meters. It only takes two people to jet a well. Jetting is only suitable for soft, fine-grained sediments. Gravel is too heavy for the return water to bring it to the surface. The diameter of the borehole is only slightly larger than the drill pipe/casing. Therefore, it is difficult to install an adequate sanitary seal to protect the well from surface water contamination. This is a mechanized version of manual percussion drilling. The heavy drill bit and related parts are called the ''tools'' and they are raised and dropped on a steel cable. Cuttings are removed with a bailer. Several meters of water must be maintained in the borehole to keep the cuttings suspended. The machinery ranges from a very simple skid-mounted powered winch with a tripod to a complex set of pulleys and drums with a large mast. The larger cable tool rigs are mounted on a trailer or the bed of a truck and use hydraulic motors to raise and lower the mast and rotate the drums of cable. Compared to other drill rigs of a similar size, a cable tool rig will drill a water wellvery slowly. When drilling in loose sediments, it is necessary to drive steel pipe behind the drill bit to keep the borehole from collapsing. The sections of this drive casing must be welded together going in and cut apart coming out. So an arc welder and a cutting torch are needed on all but the smallest cable tool rigs. The tools on a medium to large sized rig are very heavy and require a cable and winch to move around. There are many ways to get injured on a cable tool rig. 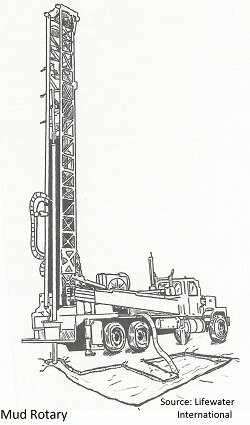 There are many kinds of mud rotary drill rigs used to drill a water well. They fall in two basic categories; table drive, where the drill pipe is turned by a rotating mechanism near the base of the rig, and top-head drive, where the drill pipe is turned by a motor attached to the upper end of the pipe. In both types, the upper end of the drill pipe is attached to a lifting mechanism that raises and lowers it along the mast. Both types of mud rotary rigs also have a swivel attached to the upper end of the drill pipe that allows drilling mud to be pumped down the drill pipe while the pipe is rotating. The larger the rig, the faster and deeper it can drill. The LS100 and LS200 drill rigs are mud rotary rigs at the small end of the range of drill rig sizes. Because the borehole is kept open by the pressure of the drilling mud, it is not necessary to use a drive casing as with cable tool drilling. Mud rotary drilling is also much faster than cable tool. A large mud rotary rig can drill a borehole 60 cm in diameter to 1,000 meters or more. Even a small rig like the LS200 can drill a 20 cm porthole to a depth of 60 meters. Drilling through rock requires a great amount of weight on the drill bit so only the larger mud rotary rigs can effectively drill in rock. Most mud rotary rigs have a motor to rotate and lift the drill pipe and a motor to operate the mud pump. As a result, mud rotary rigs use more fuel per hour than a comparable cable tool rig. 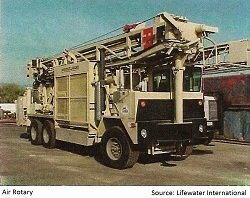 Most drilling operations that use a large mud rotary rig also require support vehicles to haul water and drill pipe. The mechanical elements of an air rotary drill rig are similar to a mud rotary rig; table drive and top-head drive are the two basic options for rotating the drill pipe. The principal difference is an air rotary rig uses compressed air to remove cuttings rather than drilling mud. A type of ''foam'' can be added to the air stream to improve cuttings removal and provide some borehole stability. An air rotary rig can use the same type of drill bits as a mud rig, but it can also drill with a down-the-hole hammer. This type of bit uses compressed air to break up rock and it can drill very fast. A large air rotary rig can drill a borehole 60 cm in diameter to 500 meters or more. Because there is no drilling mud to mix or settling pits to dig, an air rotary rig can be set up very quickly. 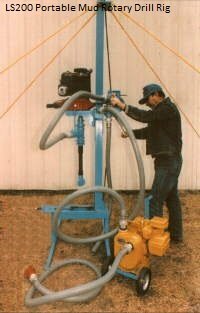 An air rotary rig also drills much faster than any other rig of a comparable size. An air rotary drill rig requires a very large air compressor, especially if a down-hole hammer is used. This adds significantly to the cost of the rig, its maintenance needs, and its fuel use. A large air rotary rig will consume 40-60 liters per hour of fuel, making it one of the most expensive types of drill rig to operate. Large air rotary rigs also require support vehicles. Swiss Centre for Development Cooperation in Technology and Management (SKAT) has published a manual entitled "Drilled Wells" which covers additional topics and information on the subject of how to drill a well. The PDF of that manual can be downloaded here. Return to "Groundwater" from "Methods Used to Drill a Water Well"
CLICK HERE to learn more about how YOU can create lasting change!